Who Are the World's Most Attractive Employers in 2015? Who Are the World’s Most Attractive Employers in 2015? Universum have released further findings from the Universum Talent Survey, this time revealing the top ten most attractive employers in the world of 2015. The ranking has been put together based on the responses from more than 120,000 students from some of the world’s top universities. Why are the top employers so attractive to job seekers? Findings from the survey demonstrated that Millennials are seeking purpose and innovation and the world’s most attractive employers are delivering just that. They want there to be given the opportunity for professional growth when starting in a new job and the chance to truly have an impact on the success of the company. For this reason, training and mentoring are elements of a role that appeal to a lot of millennial candidates. They also aim to truly understand a company’s purpose before working for them, to ensure that their own values and goals align with those of the business and they feel that they can contribute to the organisation’s performance. The most attractive employers inspire job seekers and storytelling is something that entices a lot of job seekers, as they are able to learn about the employees within the company, get an insight into the company culture and become familiar with the organisation’s values. So who are the most attractive employers? 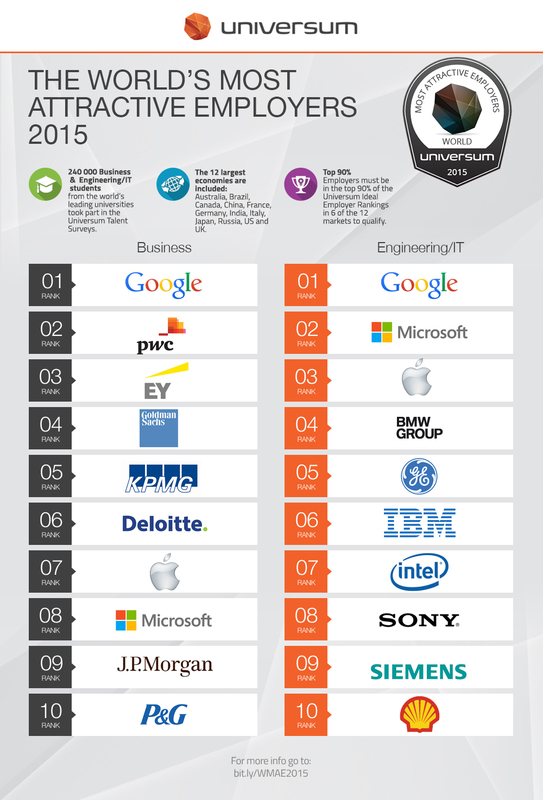 Google tops the ranking for another year among business and engineering/IT students and there was little movement in the top five among business students from the 2014 rankings. Professional service firms PwC and EY ranked highly, as a result of the training opportunities they offer which are regarded as an important factor when applying for jobs. Employers within the energy sector lost rankings in this year top employers list, while the fast-moving consumer goods industry crept up from their lower positions in previous years. What are engineering students looking for in an employer? Engineering/IT students reportedly want to work somewhere where they can be creative and innovative and desire a workplace with entrepreneurial energy. Job security is also something that they regard important when starting in a new role. What are business students looking for in an employer? Business students are more financially driven than other industries. They also rank training and development opportunities highly in the list of factors when considering an employer.